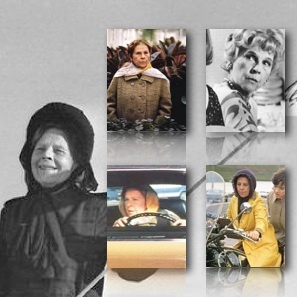 The life-loving, energy-giving almost-eighty-year-old, eccentrically wise Maude is one of the best comic roles ever, but only in the hands of Ruth Gordon. Over the top. Trained in theatre and successful with larger than life personas on Broadway such as Dolly Levi (in "The Matchmaker," before "Hello, Dolly"), Ruth Gordon is no less large on the silver screen. She was in her sixties when she started appearing in films (but for about three years in the 1940s, which included "Abe Lincoln in Illinois") so it's no wonder she specialized in eccentric old ladies. But her ladies were not just eccentric; they were sharp, clever and wise. 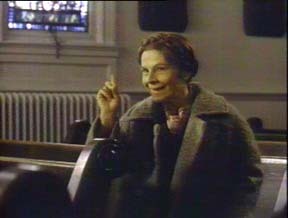 If you want to see the real Ruth Gordon, watch Katharine Hepburn in "Pat and Mike" and especially "Adam's Rib," which Ruth wrote with husband Garson Kanin, and which reflect her own cleverness and much of her own personality. Besides an occasional eyebrow raise with slowing down of the dialogue, it was all in the hands. She would bite her thumb as she was thinking. The mischievous wink and the impish smile. Pointing with her whole hand, palm up, or her thumb or fist. Squeezing up her shoulders. > The eccentricity takes a malevolent turn with her stare. > Practically every scene is a great scene: stealing the minister's car; protesting at the Sutro Baths and falling through the hole; explaining to Harold about daisies. > The lovably crabby mother to Clint Eastwood chases away a biker's gang from her front porch. > Kissing Clyde, the orangutan. > Driving George Segal, and the audience, crazy with her constant demands. > Not quite the First Lady of America's dreams, her arguments with Raymond Massey as Abe in this film adaptation of the play are powerful and disturbing.